My wife and daughter went to the new Universal Studios Harry Potter theme park recently, and raved about the butterbeer. 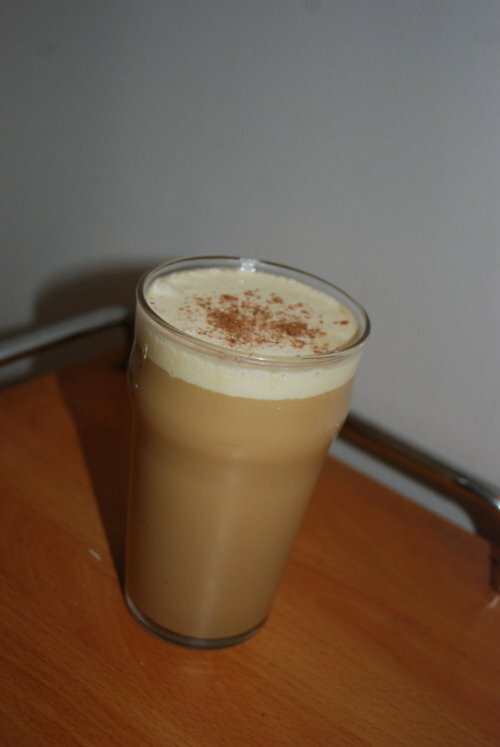 I've looked around the internet for recipes, and mostly, they seem to be versions of butterscotch cream soda. They're all mixtures of other ingredients, such as butter, brown sugar, cream soda, sometimes actual cream, spices, etc. Some are adult versions using butterscotch schnapps, most are sweet kids drinks. From the descriptions in the books, butterbeer can be intoxicating, so I imagine it really should be brewed, not mixed. However, they do give it to children, so the alcohol content must not be too high, or else there's also a kids version in the wizarding world. So, now that I've established myself as a complete geek, does anybody have any ideas for actually brewing butterbeer? I would think something along the lines of a cream soda or root beer, with some sort of butterscotch flavor would be the thing. Or am I the only one who has seriously considered this? hMMM, Interesting, I have never heard of this. But I love egg cream sodas, sounds like it may be similar. Im having loads of success making soda with tibicos.Made a ginger ale that is very nice, started one last night using brown sugar, maple syrup and vanilla bean. I wonder how butter would work out, tibicos is related to kefir so the dairy would be fine but Im not sure it would carbonate with fat in there. How are you thinking to make this, if you give it a try? I never read a Harry Potter book nor have a seen the films, but I can see how a guy with pot in his name would like such a drink. You mean like this stuff? I suppose you could make regular beer but play around with different English ale yeasts and perhaps even German lager yeasts and purposely TRY to get a beer with a ton of diacetyl in it. Ferment too cold, secondary early like after the first 3 or 4 days of fermentation, etc. This should get you a relatively buttery beer if all the conditions are right, and if you used a yeast strain that is prone to it. I've used this one before, but hey, there are new people around. Why make butter beer? Why not just buy Redhook ESB? If you want a ton of diacetyl, they sell it in the baking aisle. Our club sponsored homebrew competition this year had a soda contest. The contest was for kids and judged by kids. My son did a butter beer and it won 1st place! He used Old Fashioned cream soda extract along with butterscotch syrup with a bit of butter extract. He made several batches in two liter bottles and force carbonated them until he got the flavor he wanted. It really was pretty tasty. Had to brag on my boy a bit! I'm not sure I would want an alcoholic version but I'm sure there is a butterscotch liquer out there! I really have no idea how I would try this, was looking for some guidance here. It's an intriguing idea though. I like the idea of egg cream soda, that really does sound like it would work. OK, now I've been to Harry Potter World myself and had butterbeer, so I'm reviving this thread. Please think about all the stuff you avoid to eliminate diacetyl, and give me to opposite advice. I think I need to drive diacetyl through the roof to accomplish this. What malt/yeast/techniques will produce the most diacetyl? Sounds like 1st, short, cold fermentation. What yeast? I've seen recommendations of Irish ale yeast, English ale yeast, and perhaps German lager yeast. Would I lager it, or brew ale with the lager yeast? Any hints appreciated. Just brew up a D bomb and do your boil with the lid on. We’ve talked about butter beer in our homebrew club. Diacetyl works great for that flavor. Boiling with the lid on is generally cited for DMS. Does it produce diacetyl, too? ^^^ you right. But corn and butter flavor together. Sounds about as good as butter beer, plus you get the creamy goodness from leaving the lid on. Ferment too cold, secondary early like after the first 3 or 4 days of fermentation, etc. This should get you a relatively buttery beer if all the conditions are right, and if you used a yeast strain that is prone to it. In addition to my old quote above, you could also lock in diacetyl by racking early and often. Yeast eats diacetyl. But after primary fermentation is mostly complete, if you immediately rack the beer, chill it down, wait a couple days, then rack again, thus removing like 99% of all the yeast, there won't be as many yeasties to eat the diacetyl, thus locking it in a bit. You're crazy, you've been gone a while, but you're obviously serious about your request, so we'll help you out if we can.